I really can't believe that my marriage was almost 11 months ago, it feels that it wasn't that long ago. Too many things happened prior to my wedding day which will take quite some time to tell, but not yet. I'm going to leave for Yogyakarta (aka Jogja) now, which will be my first twice-postponed honeymoon due to me being hospitalized in July. My husband then re-arranged the trip to November, but I was hospitalized again. I'm pretty stubborn and I really wanted to go the second time, but it was impossible to go because suddenly there was also an earthquake in Jogja at that time. Yes, I know right?? I suppose the third time is the lucky charm. I'm so excited because I've always wanted to go to Jogja since forever. My first planned trip to Jogja was in 2006 with my uni gamelan group. We were supposed to go there to watch performances and meet with gamelan groups there. But would you believe it that the trip also had to be cancelled because of the terrible earthquake in 2006? Now, I think you'll understand why I just can't wait to explore Jogja. Especially because it is rich with culture, art and heritage. So anyways, I promised to upload photos of my wedding here since some people asked me to share what I wore during my wedding. I guess for this post I'll start with my nikah (solemnization) ceremony at home. Since there are so many photos and I'm in a bit of a rush, I'll blog about the actual ceremony later when I have the time. 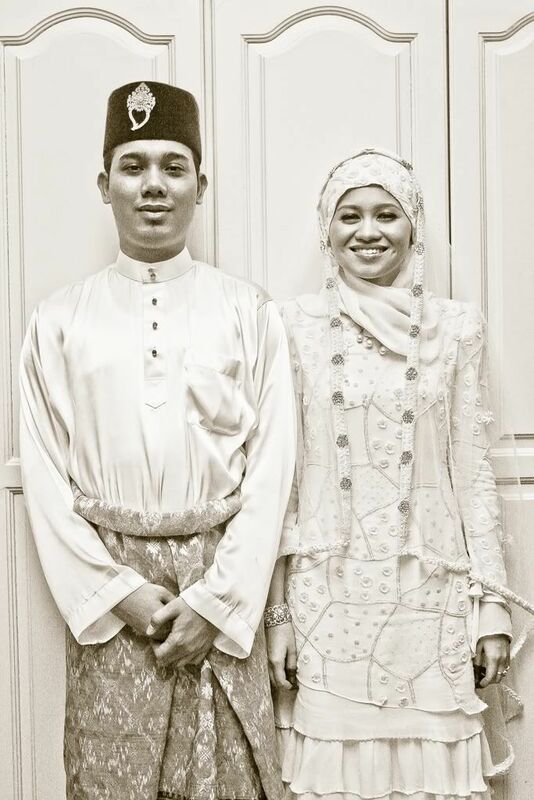 The solemnization and the receptions, were truly few of the most memorable days in my life. Pictures with a few of my friends and cousins who were there early. 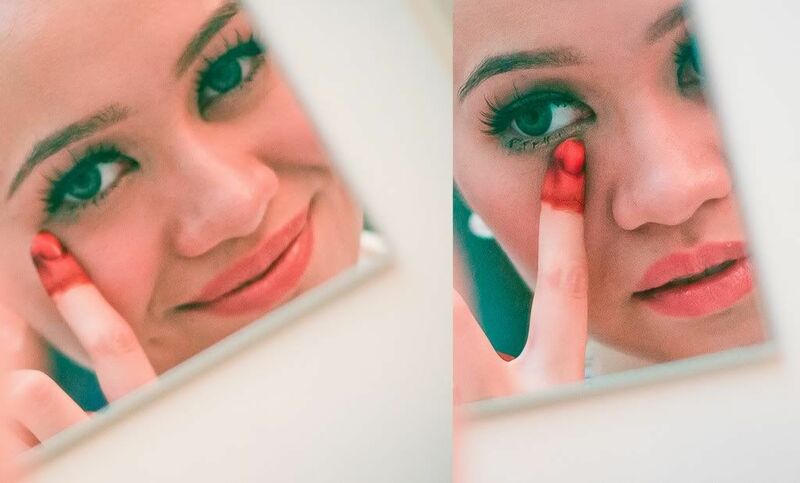 My wedding wouldn't have been so beautiful and went so smoothly without the HUGE help of my family, relatives and friends because I was in the hospital for almost all of the preparations period and was only discharged the day before the wedding. I also remember the day before my wedding when my house was full of my relatives and friends who were helping out tremendously. I will forever be thankful to them. Love you guys. 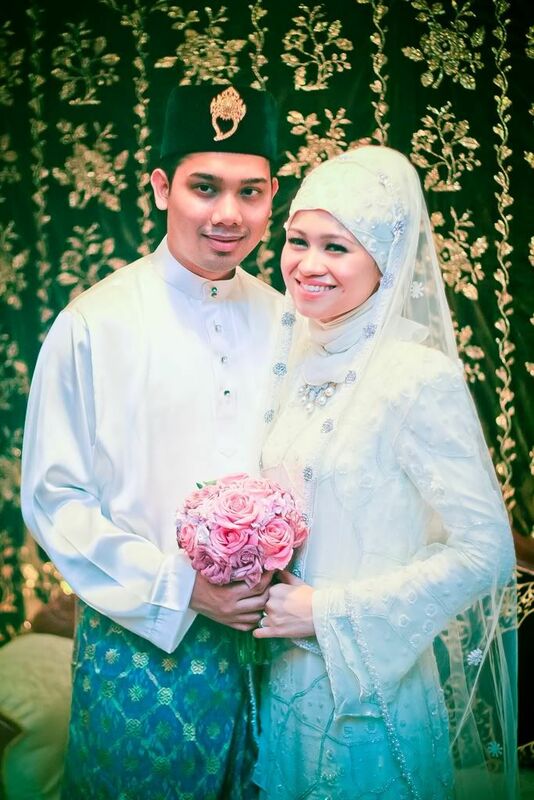 This is my nikah wedding dress designed by Cho (Azalea Ramli) of Pu3. 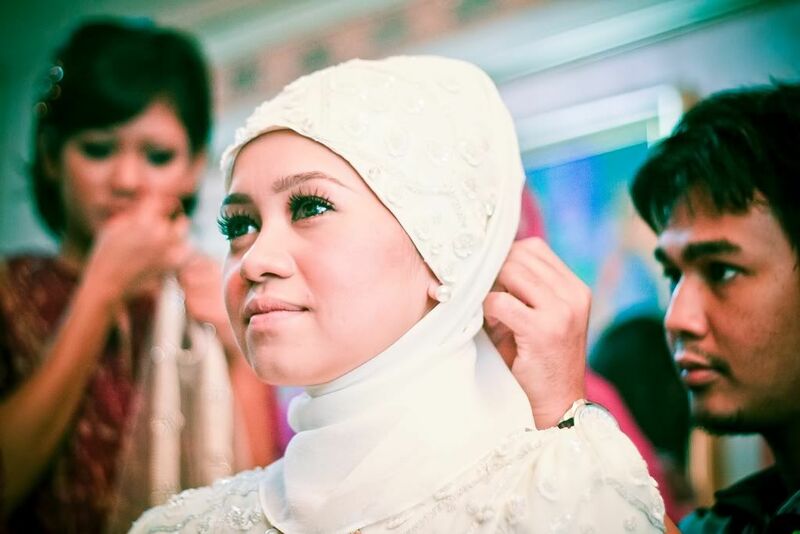 The cloth material for the kurung modern top was beaded chiffon which was a hantaran gift from my husband during the tunang (engagement) ceremony. I just love the design, texture and details of the material. The beadings were non-symmetrical as you can see. Cho did a fantastic job with the dress design. I just love it! I especially love the vintage-y and stylish yet funky shoulders which she says was inspired by Lady Gaga! 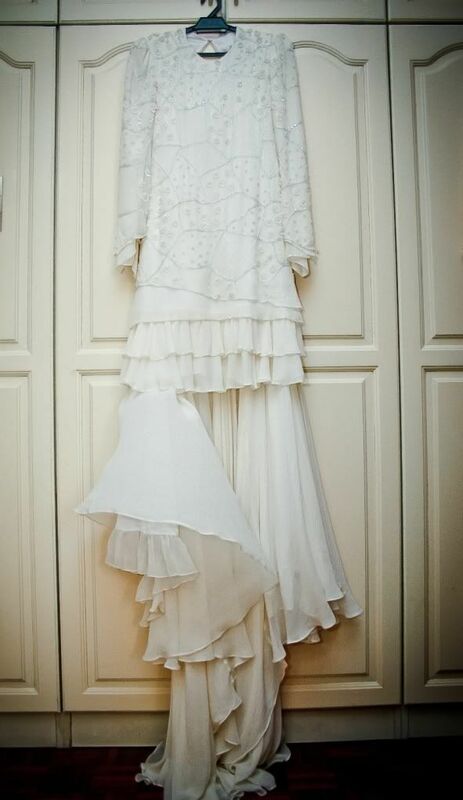 -_- Some of my friends who saw the dress told me that it was 'just so you' and I was so happy to hear that on my wedding day. It helps that Cho knows what I liked and designed it that way. It was already perfect the first time I went for fitting. That's Cho in the background making some last-minute alterations on my veil, and Najeeb Azami putting the final touches on me. I just loooooveeee his make-up. He made me look so natural and soft. His make up was flawless. I really want to learn his secrets. Hehe. Najeeb is a very friendly person and he really knows how to make me calm when he made me up. He was also quite strict and made sure no one else bothered me unless it was really important. He told me it was really important that the bride was calm and had peace of mind. Girls, if you're the nervous type and always worrying about a million things in your mind, he's definitely the guy to calm your thoughts. who designed my reception dress which you can see here. I'll do a proper post about it soon! Me walking to the pelamin (dais) accompanied by Sanah and Shereen, my besties. Just as my husband was about to put on the ring..
Hasanah and Shereen arranged for the gorgeous hand bouquet. Really love the trails. Thank you Pu3! After the event was over, I was really reluctant to take off Najeeb's beautiful make up. It was so natural and light yet even though I cried so many times that night, his make up was still perfect and nearly still flawless. There wasn't a single smudge before I took it off okay! After a very tiring night. I remember that the photographers kept telling me to open my eyes and I finally know why: my eyes look so sleepy in the pictures. I was on very powerful pain-killers at that time which made me drowsy and a little high. Haha. Credits to my good friend Pacak of Chaxphotography and Intai-Intai & Zati Hanani for the photos above. Thank you. I'll just share snippets of our aqd nikah ceremony and wedding reception on the 9th and 10th July 2010. Credits to BeeHunt Videography for the video! Sorry about my singing, it was spontaneous and I only sang after the guests had left. Didn't know they were going to put it in the video. I chose the background song as well, which was one of my favourite songs. Life in Technicolour by Coldplay. Hope you guys enjoy it. 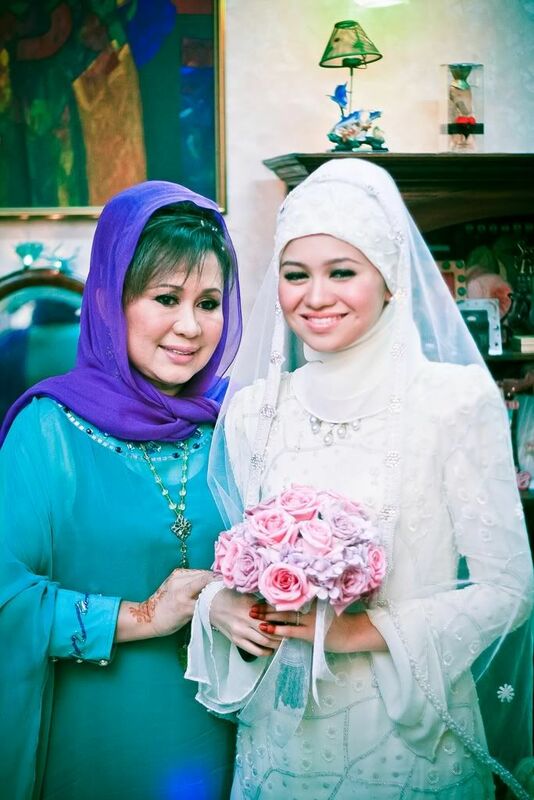 OMG..Your wedding dress, makeup, senang cakap everything about your wedding memang sangat gorgeouslah. Definitely one of my favs! being u as a good fren is a wonderful experienced ever. omg, your wedding is phenomenal. love the peach color theme :) congrats! my first time commenting on your blog,your wedding was one of the main highlights of my 2010. we had so much fun working as one biggg happy unit kan? cousins,aunties,uncles etc etc. Since everyone is busy with works and whatnots, we shud really find time for a get-together, more like a post-reception thing to tengok all the pics, from tunang to the reception kan? 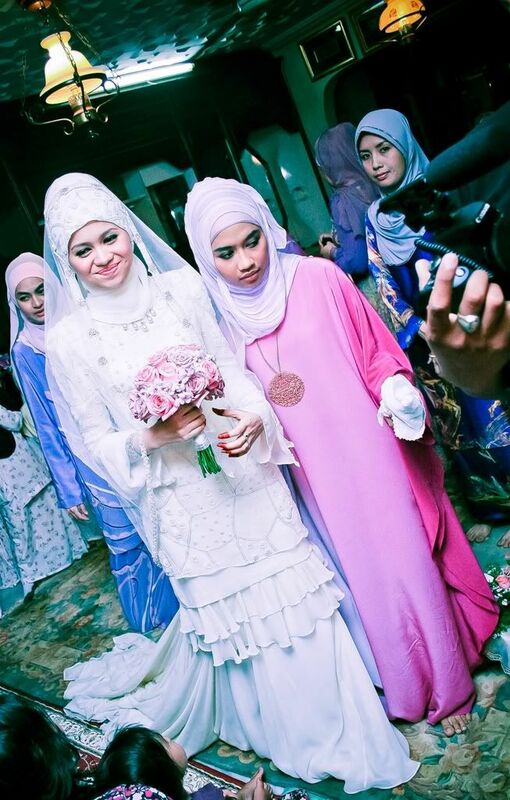 Hye there,im zara's friend and looking through your pure Perak's pelamin ..so adorable and vintage !Anyway, the wedding dress also looking so lawa!Heart u ols ..i saw your picture in Hana Tajima's outfit ..MYSAAR .it was lovely and perfect!kudos to u .and congrats! sabrina! what a damn gorgeous dress u got there??!!! oh btw, why were you hospitalized? Im so happy reading this post, knowing that u were longing for coming to Jogja,, since im from Jogja and so proud of it! teehee..